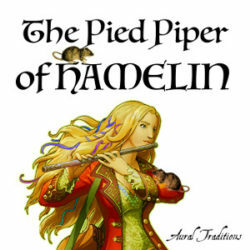 The people of Hamelin were plagued with rats until a feisty piper came to town with a promise to rid them of their problem… for a fee. Please enjoy our adaptation of the Robert Browning poem that teaches the lesson that one must keep a promise. If you vow to pay the piper, pay her you shall. Additional background voices performed by Cary Ayers and Owen McCuen (Twitter).